Baroque throne chair upholstered in beautiful plush Red velvet fabric and gold leafing frame. Queen chair designed with rich detailed hand carvings offering great scale and grandeur. 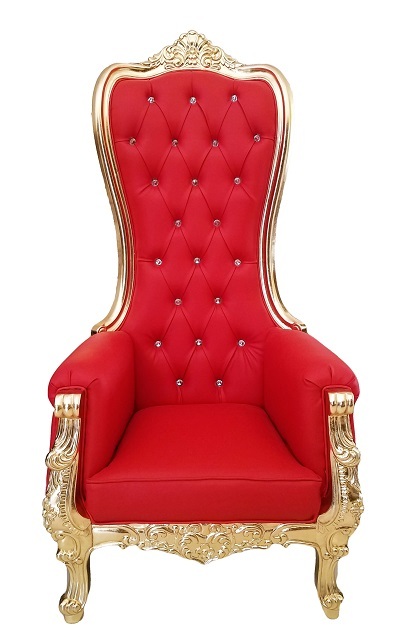 Throne Chair Upholstered in Luxurious Tufted Red Velvet with Hand Finished Gold Leafing. Multi-Use as Living Room High Back Chair, Dining Room, Bedroom Chair, Hotel Lobby, Club, Commercial Seating, etc.